Many a time the outdoor audio or video recording becomes imperfect due to a ‘dying’ battery. If the battery voltage is less than 9V for a 12V recorder, the output during playback will not be of a good quality due to variations in the motor speed. Many car owners take their battery for granted, rarely giving it the maintenance required. As the winter nights advance the demands made on this vital power source increase. Combined with the inevitable aging process and diminishing ability to store a charge for a long period, this makes the requirement of a simple aid to monitor battery voltage continuously obvious. 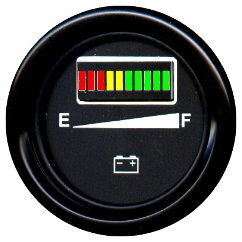 The indicator was therefor designed to forestall any incipient failure by providing ‘at a glance’ information on battery state with three coloured LEDs. red that the cell was dead. When the battery is in top condition, its output voltage will be around 13V and, of course, even higher if recently charged. This potential is applied via D8 through R4, D7 and R5 to the base of Q2. This turns Q2 on, causing D6 to illuminate via R3. 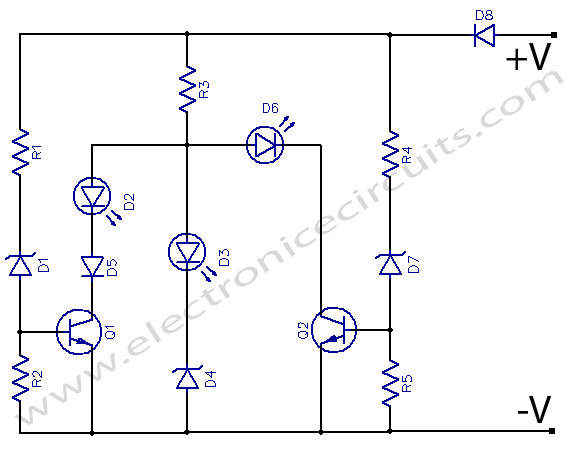 At this time Q2 effectively places a short circuit across the rest of circuit via D6, preventing D2 and D3 from emitting light. As the battery voltage becomes lower,Q2 begins to turn off as the threshold of D7 is reached.This allows D2 to conduct as Q1 has all the time to be turned on via R1, D1 and R2. (D5 increases the voltage required for turning on D2 when T2 is on.) The current thus drawn via R3 precludes D3 from illuminating as the potential across it and D4 is not above the zener level. Eventually, at still lower battery voltage, Q1 will turn off in the same way as Q2, allowing potential at the junction of D2, D3 and D6 to rise in excess of 5V zener level of D4 which begins to pass current and illuminates D3. Zener diodes may be selected for other switching points and / or battery voltages. A nice, simple and elegant circuit. I built one, and I’m very pleased with it’s performance. 1 Pings/Trackbacks for "Simple Battery State Indicator"